I had a pleasure presenting my talk at Edinburgh Azure User Group’s first meetup last week. My session was about “Serverless API using Azure functions” The session was on deep dive into developing serverless REST API on Azure functions with a real-time example, Exploration to tooling options, testing and deploying pre-compiled functions alongside a discussion on different ways of securing the APIs. My slides from the talk is available on slidesshare. I recently had an opportunity to present my talk in Global Azure Bootcamp on saturday (21st April) at Glasgow. My session was about “Serverless Computing with Azure” which was heavily focused on azure functions. My slides from the talk is available on slidesshare. Other speakers were Gregor Suttie and Kenny Lowe. Gregor’s talk was on learning Azure and becoming exam ready. Kenny’s talk was on Azure Stack and Modernise Applications Anywhere. I enjoyed learning and sharing all about Azure and meeting new technology enthusiasts in the community!! Amazon lex uses the same deep learning technology as Alexa. With Lex you can create your speech or text chatbots which can provide seamless natural language experience. This bots can be integrated with other services provided by AWS like Lambda, MobileHub and CloudWatch etc. Lex allows you to easily publish the chatbots to mobile devices and to 3rd party messaging service like Slack, facebook messenger. At the moment AWS Lex is only available in two regions US EAST (N. Virginia) and EU (Ireland). You can start with one of the sample chatbots (BookTrip, OrderFlowers, SceduleAppointments) provided by amazon or build your custom one from scratch. Intents, Utterances, Slots, Prompts and Fulfillment are the basic components of amazon Lex. The picture below explains the basic components for hotel booking, one of the sample bots provided by amazon lex. Here, my goal is to create a custom chatbot with the intent to register users for pre-defined event types. 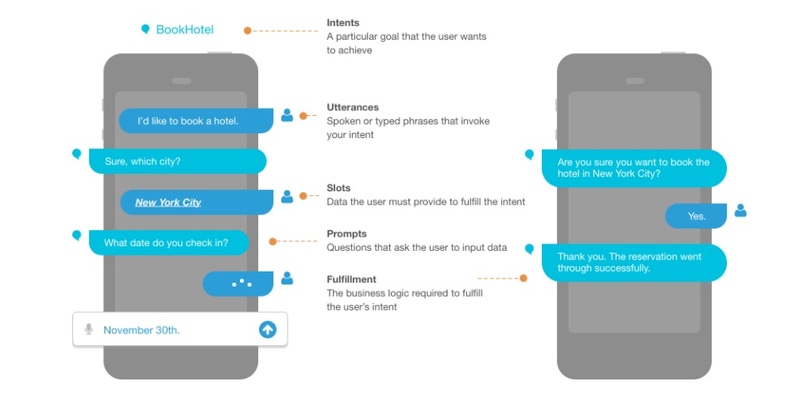 You can create sample utterances, provide type of input that user should prompt to user to fulfil the intent. Here I am going to create a custom slot type from aws CLI. Configure your AWS CLI with accesskey for your account. Use put-slot-type for creating custom slot type. Once deployed you can add it to the slots for your bot. Assign lambda function that we just created to fulfilment intent. Build and test your chatbot.